Oh, What an Untangled Web We’ll Weave? The Internet, we’re told, wants information to be free. It also wants information to be free of government regulation. And so far it largely has been, thanks to promises of self-policing by web publishers. But both the industry and the government might become bystanders in that tug-of-war according to this Wall Street Journal piece. We’re about to see what happens when industry self-regulation fails. It will not be pretty. And it will be the free market, not government, that applies the pain. The industry is the online advertising and marketing business, notably the marketers that develop targeted advertisements based on your Internet activity. Which produced the $37 billion of Internet ad spending last year. And produced no end of complaints about invasions of consumer privacy. 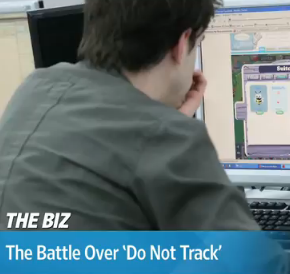 That’s led to the Do Not Track movement, which has yet to gain any traction in the virtual world. To see the disconnect over the issue, consider that marketers, such as the Direct Marketing Association, believe that privacy has already been addressed. They point to the “Ad Choices” icon that appears on Internet ads that, if clicked, takes Internet users to a site where they can opt out of receiving behavioral advertising. The program was created by the industry under pressure from the FTC. So, to summarize: The industry solution to protecting consumer privacy is no solution at all. It’s left to Apple’s Safari, Mozilla’s Firefox, and Google’s Chrome to install a cookie-blocking default option. Anyone want to get behind that? What chance does $37 billion stand against integrity?